Wicked Bandwidth, Inc., a high-speed Internet Service Provider, announced the release of Voodoo, a fully redundant Internet solution guaranteed to deliver 100% uptime to business customers throughout the Boston area. 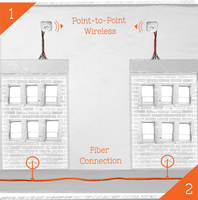 The new Internet solution offers unmatched reliability using innovative dual path technology that combines Wicked Bandwidth's fiber-based network with the diversity of high-speed point-to-point wireless Internet. As businesses continue to gravitate towards cloud-based applications for collaboration and offsite data storage, the importance of having a continuous Internet connection has increased. Voodoo was developed to reflect Wicked Bandwidth's commitment to empowering customers with Internet services that align with the changing landscape and growing need for reliable connectivity. "Today, businesses rely on their Internet connection for a lot more than they used to," says Steve McCarthy, co-founder of Wicked Bandwidth. "Losing your Internet connection means losing access to all of your business applications and a loss of productivity. We created Voodoo to give customers greater assurance of reliability and guaranteed uptime to access the cloud-based applications they need to do business." To maximize uptime without requiring customer intervention, Voodoo uses fully automatic failover technology that seamlessly routes traffic across the Wicked Bandwidth network. In addition, Voodoo is engineered to deliver service using existing IT systems and network infrastructure, meaning no new customer premise equipment or special configuration is required. Wicked Bandwidth is a Boston-based Internet Service Provider offering fiber-based commercial Internet at blazing fast speeds and affordable rates. Ideal for small to mid-sized businesses, Wicked Bandwidth is dedicated to providing under-served buildings in Boston with better bandwidth options at competitive rates. Wicked Bandwidth was founded in 2014 by industry veterans Steve McCarthy, Mike Murphy and Mike Spieldenner. Inquire about bringing Wicked Bandwidth to your building today at http://www.WickedBandwidth.com.